The earliest know illustration of the Silk Road. A caravan is crossing the desert of Chinese Turkistan, the camels laden and the merchants horseback. Three ‘S’s are said to have transpired one of the phenomenal trade explorations in the ancient as well as modern history of mankind. It was for the love of ‘spices’, ‘silk’ and a bit of ‘soul’ searching that led the Europeans to reach out to the coasts of Asia and partly Africa. Indian Ocean, onto Persian Gulf and thence to the Mediterranean was the established maritime corridor of this trade. These trade expeditions during various centuries had sown the seeds for the Portuguese dominance followed by the British and Dutch colonialism in India and East Indies. This oceanic route had a land equivalent that was called the Silk Road. The ‘Silk Rod’ carried on it ‘the caravans’, and dear reader, historical portraits here paint a picture of goods laden camels traversing a landscape that varied from the snow-clad mountain peaks to the flat dry deserts. The stringed rows of hundreds, and on occasions thousands of camels, loaded with tons of freight, the sleigh bells perfectly rhyming with the rhythmic motion of their toes, weaves a tale as enchanting as that of one thousand and one nights of Sheherzad. For these travelling caravans, oases being the natural stopping places, gradually developed into cities and established marketplaces. The ancient cities of Samarkand, Bukhara, Tashkent, Kashghar and many others derive their roots from these legendary caravans. These lands of the Silk Road brought together a vibrant mix of varied cultures and societies. Silk road was a series on caravan routes beginning at Xi’an, China in the east, following the Great Wall to the northwest, and circumventing the Taklamakan Desert in present-day Western China. It then crossed the Pamir Mountains to Sogdiana and Bactria… Continuing across the Persian plateau, the route ended at the eastern Mediterranean coast. Among many off-shoots of Silk Road was a trail south across the Karakorum Mountains, through the Hunza and Gilgit tributaries to the “Father of Rivers”, the Indus. It then passed Taxila, the ancient Buddhist center, and descended to the Arabian Sea. Over the years the trade on Silk Road gave rise to a number of sub-routes and deviations. A historical and prominent off-shoot ran across the northern shoulder of Pakistan entering through Karakoram mountains and and then aligning itself with river Indus. Towards its upper stretch it ran from Bactria to Thakshasila (Taxila) and it was here that it corresponded to the Uttarpatha, the great North Road. Uttarpatha, one of the greatest highways in the history, ran across the shoulders of the Sub-Continent and is reported to have existed since 500 BCE. This road has seen some great dynasties, from Mauriyan Empire all the way through to the Mughal Kingdom and the colonial days of British Raj. It was during the times of Suri King, Sher Shah who took power after the death of first Mughal Emperor Babur, that the road was refurbished with regard to the pavement itself and the travel facilities in the shape of shady trees, stepped wells and caravanserais. This road popularly called Grand Trunk Road (also Jarneli Sarak and Shahrah-e-Azam) runs from Kabul (present day Afghanistan) to Chittagong (present day Bangladesh). Such was the influence of Suri King in administratively improving this great trade route, that through common belief (although in error) he came to be known as the originator and architect of this historical path. G.T.Road, significantly refurbished by Sher Shah, and later on improved upon by the successive Mughal Kings followed by the British, is a historical footprint on the present day map of Pakistan and India and still bears on its alignment, scores of monuments with the associated tales from the by-gone days. All along the ancient route, Jarneli Sarak bears on it the remains of the landmarks associated with travel and trade. A number of these include the forts, caravanserais, accessories like stepped wells and milestones. These landmarks do reveal the alignment of this grand road, it’s quite unusual that we do not come across the remains of the actual road itself. Following the realignment brought about by British after the railway track was laid, the old route became increasingly disused and eventually abandoned. Almost all of it lost it’s existence as cultivation and other land developments in Punjab and the Frontier gradually wiped from surface, the trace of the ancient G.T.Route. The surviving landmarks too are not well preserved and majority of those have already lost to neglect and the ones that remain are already crumbling. Dear reader, to visit an original portion of the ancient GT Road, we will head to the city of Taxila. Present day G.T.Road from Rawalpindi, as it heads to Peshawar, takes us to a prominent landmark in the neighborhood of Taxila. There, just beside the Margalla Pass, stands in prominent isolation on a low knoll, the Nicholson’s Obelisk. Erected to honour Brigadier General John Nicolson of the British Military from the days of Empire, has attached to it the original portion of G.T.Road paved with flattened stones. This portion of the ancient route is on an alignment that having traveled from Serai Kharbooza leads onto Margala Pass. Margala Pass, dear reader, whose beauty is eclipsed by stone crushers that are in abundance and have turned the erstwhile green and hilly landscape into grey craters and dust. A little over 150 yards in length, the road survives and has some consolation signposting from the archaeological department declaring it a protected site. There in the documents somewhere is reported a stone slab with Persian inscription from Alamgir’s times that was discovered at this site and later moved to Lahore Fort. I tried my luck there but people at the fort had no clue of any such relic. This piece sliced from the grand road with beautifully paved and flattened stones is a strolling feast. If one is at Gurudwara Roori Sahab on the north-western periphery of Eminabad, there is much to see from the pages of history, so much so that it’s quite normal to get too absorbed with the Gurudwara itself and miss out something that lies in the immediate neighborhood. I was there and lost myself to the place of worship attributed to the days of Guru Nanak’s stay during some really trying times for the city (and I shall cover this visit in a separate post dedicated to Eminabad itself). Absorbed into the Gurudwara I was, and thus missed altogether a gem from history that just lies just next to the boundary wall facing the road that connects Eminabad to Gujranwala. 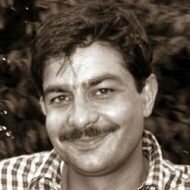 I was to discover it the hard way on a next visit that initiated from the opposite way, in the heart of Gujranwala, when I took on the old, rarely plied on and (understandably) scorched road leading to Eminabad. 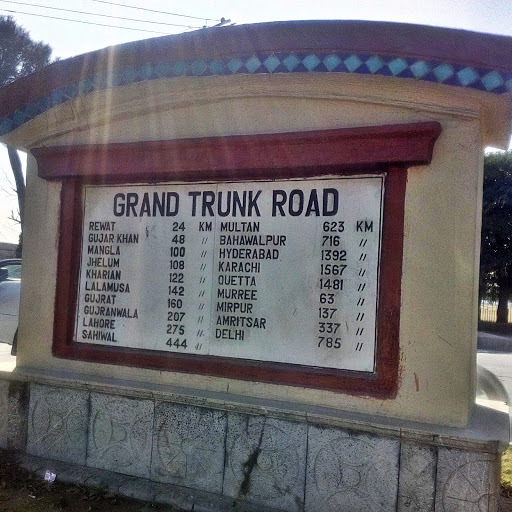 I was looking for a surviving patch from the Mughal Era Grand Trunk Road that was reported to exist somewhere between Eminabad – Gujranwala, but where, I had no clue! It was the maestro, Dr Saifur Rahman Dar who had mentioned of its existence and the exact phrase used for the description of the said relic was “a portion of ancient GTR, with brick-paved berms”. In this short description there was everything to entice the heart and there I was taking the Gujranwala – Eminabad Road originating right in front of Sheranwala Gate. Hopes were grim of finding something for what the only documented evidence was itself more than twenty five years old. It took me some patient driving and a bit of luck that on the outskirts of Eminabad some directional aids led me to a native elder (by all definitions of rural wisdom). There was a gathering of Sikh Yatris at the Gurudwara and a contingent of security officials was deployed outside. I stopped there for having a break and some gup-shup. I might sound a bit dramatic here, but my readers would allow me this liberty to say that among those officials, one person was craftily placed there as I was destined to meet him that evening. He had a key to the clue I had been in search for the entire day. Just beside the Gurudwara Ruri Sahab flowed a small water channel, a rajwahya in local term. I was told to follow the flowing water until I came across an antique structure, a haveli from ancient times where I was to look for Abdul Majeed. I did exactly as told and met my host of the evening at the ‘haveli in ruins’. A local elder, who was actively involved in the evening chores typical of a farmer’s dera. During the ‘settling in conversation’ the gentleman weighed my intentions of being at his place. It was my question on the Old GT Road that brought a smile in those seasoned eyes and at that instance my instinct told me that I was at the right place. After a quick round of desi refreshments, we headed to find out the ancient Grand Trunk Road. It was right there, a few yards away from the present day Eminabad-Gujranwala road, a patch of around 70 – 80 yards. It appeared to me just another katcha (dirt) track that is used by the wheeled carts in a village that terminated at a standing tree among the cultivated fields. It had the wild growth typically that of tall grass on it. 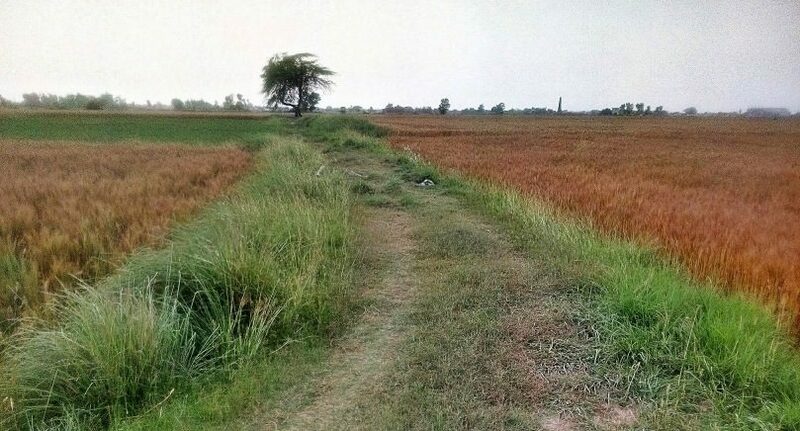 My host told me that it was the surviving patch from old Gujranwala road whose original bricked surface was now buried under the layers of dust.This track platform was considerably raised from the surrounding fields. We got down into the wheat crop and it took me and Abdul Majeed quite a bit of pruning to unveil the bricked edge of the road berm. Thin brick tiles plastered in the typical way that is characteristic of the structures from Mughal and Sikh era. The road was raised around 1 foot from the present ground level and there was evidence of the berms going further down with bricks buried in ground. There it was, the original piece from the Mughal era Grand Trunk Road, though buried to the times and neglect yet surviving and revealing its true colors on places. This original piece of the ancient route needs to be professionally restored and preserved as our national heritage. Thanks to my host of that evening, It was one pick of all the finds related to ancient GT Route, a trail on which I had endured quite an outreach. Abdul Majeed took me along to another landmark, a baoli (stepped well) just beside the boundary wall of Gurudware Ruri Sahab. It must have been a short halt beside the royal road. The baoli was partially filled with it’s ruined structure peeping out from the wild growth around it.